The world has finally realized what Toronto residents have known all along. 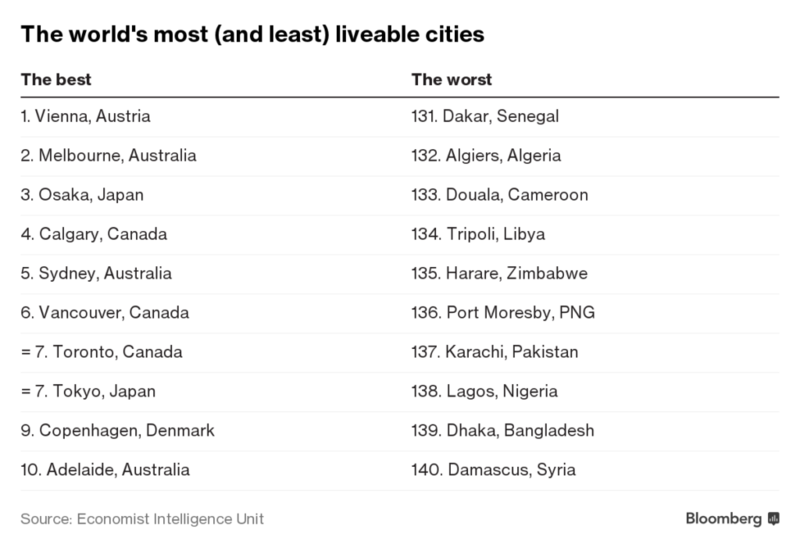 The Economist Intelligence Unit just named Toronto one of the most liveable cities in the whole world. 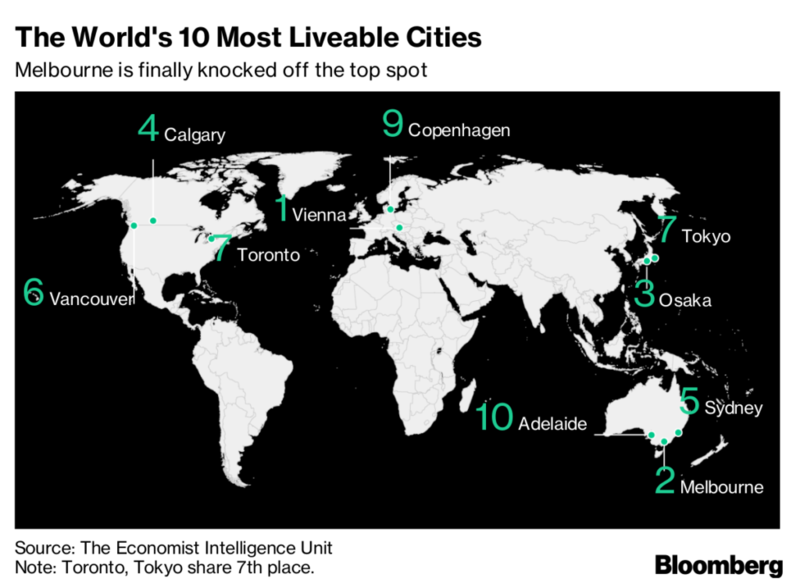 Toronto tied with Tokyo as the seventh most liveable city in the world. The EIU assess cities based on a number of factors, awarding them a score out of 100. Items such as stability, culture and environment, education, infrastructure, and healthcare are all weighed. For each factor, a city is rated as acceptable, tolerable, uncomfortable, undesirable, or intolerable. Vienna, Austria earned the top spot this year as the most liveable city in the world. Melbourne had previously held first place for the past seven years. EIU attributes Vienna’s rise to increased security and stability to the area. Tokyo’s ranking also increased from last year. The city’s declining crime rates and improvements in public transportation moved them into the top ten. Toronto wasn’t the only Canadian city to make the top ten list. Vancouver and Calgary also placed on EIU’s 2018 ranking. Calgary was ranked number four overall with Vancouver not far behind at number six. Canada and Australia had the highest number of entries on the top ten list, both with three of their cities making it. Tokyo and Toronto tied for seventh place, both being awarded a score of 97.2 per cent. Vancouver came in just above them with a score of 97.3 per cent. Calgary was ranked even higher, getting a score of 97.5 per cent. Many people may be surprised to not see many large, bustling cities on the list besides Toronto and Tokyo. EIU stated that these large business centers tend to be victims of their own success. “The ‘big city buzz’ that they enjoy can overstretch infrastructure and cause higher crime rates,” they explain. New York places 57th, London 48th, and Paris 19th overall. However, in Asia, Hong Kong’s rankings went back up after a serious decline back in 2015. Hong Kong was awarded a score of 91.3 per cent moving the city up to 35th place. It is not surprising that Toronto ranked so high. Toronto is one of the fastest growing cities with more people coming here every year. Toronto residents are proud of their city and it’s nice to see that recognition.